Happy 2017! Come celebrate the New Year and relax to good vibes, good eats and good people! We will have some of city’s best cannabis companies showcasing their products for your enjoyment! This is a downtempo affair, with live entertainment and one free pre-roll included with ticket. Ababa will be serving up deliciousness all night with drink specials available. Cash is strongly encouraged. 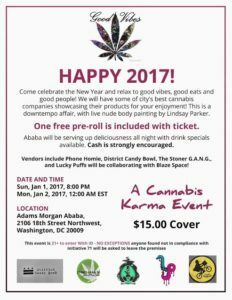 Vendors include District Candy Bowl and The Stoner G.A.N.G.! more to come….